While buying a home, it is human to get emotional. 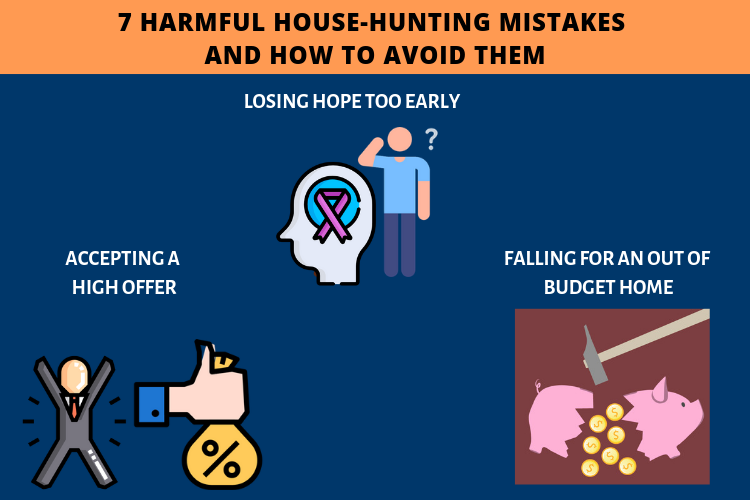 Amidst all this pool of emotions flowing in, involving excitement and nervousness at the same time, it is common for you to fall prey to some commonly committed buyer mistakes. Purchasing a house is a very significant decision in one’s life, and tends to have numerous implications depending on an individual. Therefore, when taking such a big decision in one’s life it is very crucial to keep your emotions controlled, to help you settle upon the most rational choices possible. Here, I will walk you through a checklist of the most common house-hunting mistakes. Preventing yourself from falling into these traps will surely help you find your dream home-sweet-home. This may happen in situations when you are not finding houses alike or as good as you want, or getting a higher price for the same. In such conditions, it is possible for anyone to get desperate to get into their new house in the immediate future. Losing hope and making a move into a house that you will end up hating, will only prove you costly at the end. The costs involved would be that of the transaction, agent’s commission, the closing costs for the mortgage of your new house, and not to forget the moving-in expenses. Remember that renovations are expensive, and tedious. Be patient to wait a little, unless something robust comes your way. Physical damages may get repaired, but the emotional damages attached may sometimes be irreparable. It is very important to be practical and do a budget reality-check, while house-hunting. It is very difficult to go back, once you have fallen for a particular house. You may even start dreaming about how beautiful your life would be if you had that house and all the amenities it offered. But, in case you are unable to afford it, you are only punishing yourself with your imaginations. To avoid this temptation and consequently disappointment, it is better you look for houses in your budget. In case you face difficulties with the home you have decided upon, you can consider going ahead and exploring more. There could be multiple snags of various kinds like a strenuous possession date, or major repair issues, or an asking price. In such conditions, being open to continue your house hunting can save you from making impulsive decisions that you may regret later on. With the rising competition in the real estate industry, it is likely to get carried away upon finding a place that you really like. Getting sucked in the bidding war, you might lean on offering a little too much and getting caught up with a couple of possible difficulties henceforth. Be rest assured that your purchase rate is rational as per the home comfort and its location. This can be done by analyzing relative sales around. Sometimes, amidst the excitement of having your own home, you may tend to overlook certain major problems that can prove to be difficult, costly and even impractical to transform. Remember the real estate industry is huge with new houses coming every day. Be patient while considering your options, and very careful before making any formal commitments. Sometimes, it may be required to be a little vigorous, but this doesn’t work always. This needs to be balanced to ensure that you get the best deal for the biggest asset of your life. Taking some time to contemplate upon the decision, will also give you the opportunity to analyze the property worth, and accordingly propose a suitable price. Just to be careful, you may tend to drag your feet while making the final decision of sealing the deal. However, in this balancing act just be sure that you don’t take so long to a degree of actually losing a good deal. Sometimes, this can also prove to be financially disappointing. For self-employed people, time is money. The more time and intensity you invest in house-hunting, the lesser will be the same available for your work. Here, if YOU don’t execute your decision within time, someone else might. This can lead you to putting more of your time in continuing the search. Buying a house is a big, and one of the most important decisions of your life. It is natural for your emotions to play their role here. Rather than letting your emotions outdo your rational decision-making power, you should actually slow down and transcend your emotional attacks to emerge out with a decision that is cordial both with your pocket and feelings .Or else, keep trust and seek your agent’s opinion.